The Washington Nationals had a chance to prove themselves after falling flat in their Monday night 9-1 loss to the Chicago Cubs on Tuesday at Nationals Park.The team came together for a fundamentals touch up session before game time to refresh their defensive reflexes, but staying sharp in the field proved no match for Cubs right-hander Carlos Zambrano. The often passionate Zambrano maintained control of his emotions and his pitches, allowing just one run on five hits while striking out eight of Riggleman’s Nats. He worked fast, pitched effectively, had some quick innings, and got ground balls. “We really didn’t have a lot going against him,” Riggleman said. Washington stranded five base runners in the first three innings, bringing only one run home off a Ryan Zimmerman RBI-single in the third. The next runner to reach scoring position didn’t enter the game until Zambrano’s exit in the eighth. 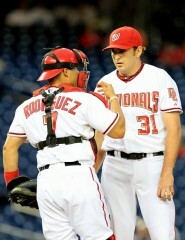 Zambrano’s A-game isn’t the sole reason the Nats found themselves hanging by a thread. John Lannan’s two pitching mistakes each resulted in a home run, which is why the Cubs starter – who’s had a shaky summer including a stint in anger management and some time in the bullpen – left the game with a 5-1 lead. Former National Alfonso Soriano went long for the twentieth time this season marking his ninth consecutive season with twenty or more home runs with a three-run blast to the left field bleachers in the third. Soriano also scored on a first-pitch two-run home run off the bat of rookie outfielder Tyler Colvin in the fourth for some extra insurance. Adam Kennedy shot a rush of adrenaline back into the game for a bottom of the ninth rally off Cubs closer Carlos Marmol making it a one-run game. A three-RBI standing double to right field with two outs got Nats fans on their feet among an excited crowd of Chicago fans cheering for their Cubbies. Ryan Zimmerman had a chance to tie the game with a single or win it with a walk-off but popped out to right field. Tuesday’s loss is the sixth consecutive win for the Chicago Cubs at Nationals Park dating back to a four-game sweep of the Nats last season. Tonight: Cubs RHP Ryan Dempster (11-8, 3.56) faces former teammate RHP Jason Marquis (0-6, 11.39) in the series finale at Nationals Park. The ending reminded me of a Nats vs. Cubs game in 2005. Then it was Jose Guillen going opposite field about 12 feet short of a walk-off win. Tom may remember that one.